Used Jaguar XF Review - 2016-present | What Car? 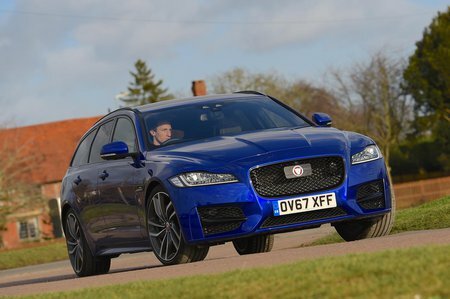 What's the used Jaguar XF estate like? Despite looking a million dollars, the original Jaguar XF Sportbrake failed to separate buyers from their cash, with just 20% of XFs sold being estates. Some of that can be explained by the rise of the SUV, which has seen people switch out of their loadlugger estates and into these on-trend, high-rise motors instead. To cater for this market, Jaguar has launched the E-Pace, the F-Pace and the electric I-Pace, but just to show that it has all the bases covered, there's also a Sportbrake version of the second-generation XF executive saloon. It looks great, just like its predecessor. As for what’s under the elegant bonnet, there's a choice of six engines, with most powered by diesel. The petrols on offer are 247bhp and 298bhp versions of a 2.0-litre, four-cylinder unit. Propping up the diesel range is a 161bhp and 178bhp versions of Jaguar’s 2.0-litre Ingenium unit, with a twin-turbocharged version also available producing 237bhp. Topping the range is the silky, smooth twin-turbocharged 3.0-litre V6. As for trim levels, there are five to choose from – Prestige, Portfolio, R-Sport, S and First Edition. Entry-level Prestige models come with 17in alloy wheels and self-levelling air suspension at the rear, as well as leather upholstery, heated front seats, rear parking sensors and Jaguar’s InControl infotainment system complete with an 8.0in touchscreen, sat-nav, a DAB radio and a wi-fi hotspot. Upgrade to Portfolio and the XF gets 18in alloys, Windsor leather upholstery, split-folding rear seats, a heated front windscreen, front parking sensors, a rear-view camera, keyless entry and a 380W Meridian sound system. The R-Sport model comes with an aggressively styled bodykit, sports suspension and a gloss black exterior. S gets you a beefier bodykit, 19in alloys, aluminium interior trim and adaptive suspension, while those looking for a little more exclusivity can opt for the tech-heavy First Edition model. The entry-level 2.0d 163 diesel feels rather underpowered. Therefore we’d recommend upgrading to the 2.0d 180. This provides enough performance for everyday motoring and returns impressive fuel economy. The 237bhp 2.0-litre four-cylinder sounds like the one to have, but in reality we found the motor to be rather hesitant and languorous. The range-topping V6 diesel is much smoother and more punchy, but obviously is less efficient. Of the petrols, the 2.0-litre 247bhp unit offers acceptable straight-line performance, but you have to work it hard to get the best from it, while the more powerful version goes really well but is too thirsty to really recommend. Unlike the XF saloon, the XF Sportbrake comes with self-levelling air suspension at the rear as standard. This doesn’t upset the car's wonderfully innate sense of balance and composure, even on the roughest of surfaces, so threading the XF Sportbrake down a twisty road is a positive pleasure. Indeed, it’s one of the sweetest-handling estates you can buy, with quick, well-weighted steering and plenty of grip. The XF Sportbrake keeps you comfortable as well. Larger road irregularities pass beneath the car with minimal fuss, while its body stays well controlled over dips and crests. It’s nearly as impressive inside. The driving position is low and adjustable and really rather excellent, with reasonable visibility. 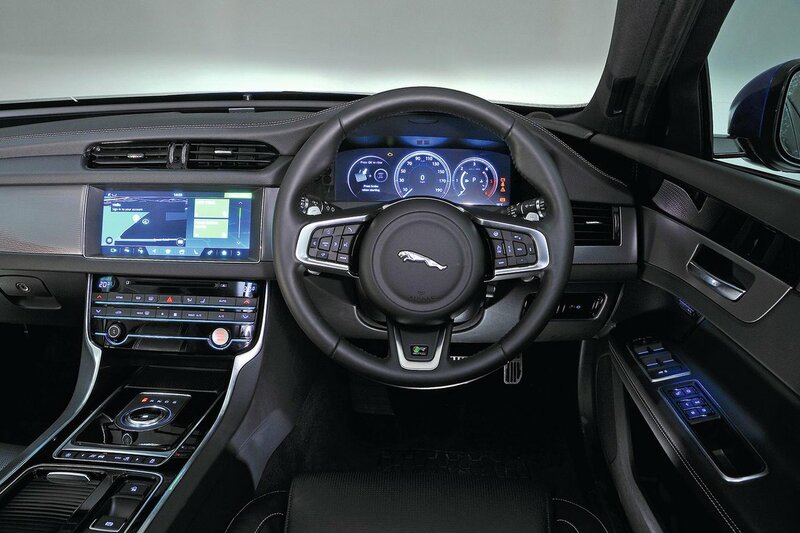 The dashboard is logically laid-out and modern and crisp in feel, with Jaguar's trademark rising gear selector and revolving air vents. The interior looks good, even if perceived quality falls a little behind its rivals from Audi and BMW. There’s plenty of interior space, too, with room for six-footers both up front and in the rear. Its boot is larger than some of rivals' and smaller than one or two others, but the loadbay is usefully flat, and it’s easy to load and unload large objects. As far as kit goes, an 8.0in infotainment touchscreen with sat-nav comes as standard. However, we would advise you to upgrade to the optional 10.2in InControl Touch Pro system. The standard unit is slow to respond and the graphics are dull, although even the upgraded system isn’t as high-resolution nor as easy to use as BMW’s iDrive or Audi’s MMI systems.